4 | Register for recreation programs online at rentonwa.gov/cybersignup We now have newer computers with the ability to boot either Windows 7 or Windows 10. Some classes use Windows 10 for instruction, with one class dedicated to only Windows 10. Backup and Restore Using File History Backup and recovery refers to the pro- cess of backing up data in case of a loss and setting up systems that allow data to be recovered if needed. You will learn what is required to use this feature in Microsoft Windows 7. File History con- tinuously protects your personal files stored in libraries, desktop, favorites and contacts folders. Over time, File History builds a complete history of the changes made to any personal file. Prerequisite: basic computer skills. This is a two- week course. 59280 Wed May 3–May 10 9:30–11:30am 59281 Tue May 30–June 6 12:30–2:30pm CMP $15R / $18NR Cloud Storage This course will give you an introduc- tion to cloud computing so that you can decide if you need it or prefer not to use it. If you have a Microsoft account or a Google account you have access to cloud storage. After this class you will know the pros and cons to using their free cloud services. Storing documents, pictures or other files can give you access anywhere you have access to a computer and the internet. Prerequisite: basic com- puter skills and one of the Microsoft or Google accounts. 59274 Tue May 2 12:30–2:30pm 59275 Thur May 25 12:30–2:30pm 59276 Tue June 13 9:30–11:30am CMP $10R / $12NR Introduction to Android Smart Phones There are some basic beginner's tips that everyone can use to master Android. You will learn how to set up a new phone, how to turn the phone off and on and turn the screen off and on, set up home screens, make and receive phone calls, add to your contact list, use text messaging, and nav- igate the various applications that come with the phone along with some sugges- tions on what applications to download from Google's Play Store. Please bring your smart phone if you have one. A Google account is recommended such as Gmail. This is a three-week course. 59362 Tue April 18–May 2 9:30–11:30am 59261 Thur May 11–25 9:30–11:30am 59262 Thur June 1–15 9:30–11:30am CMP $20R / $24NR Introduction to Computers In this course, you will learn the very basics of computers by learning how to use a mouse, what the monitor is, how to use the keyboard, basic computer ter- minology and the kinds of computer hardware that are used. You will learn how to navigate around what you see on the monitor by using the Microsoft Windows 7.0 Operating System (OS). You will learn how to use the software that is on the computer including how to access the help system and how to navi- gate the file system where your items or things you want to keep are stored. You will learn how to access and browse the internet. 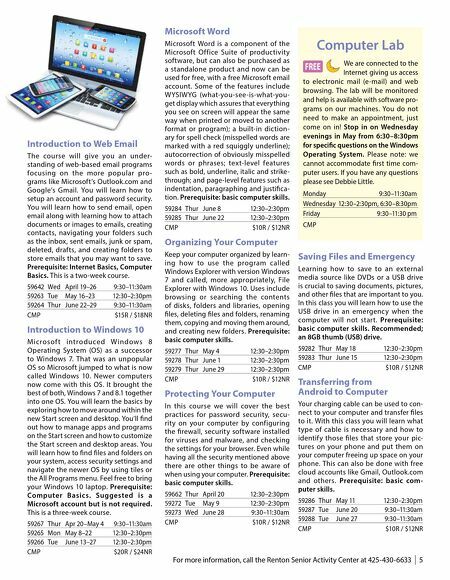 Included in this course are basic maintenance and safety precautions for the computer. This is a three-week course. 59256 Mon April 17–May 1 12:30–2:30pm 59257 Wed May 17–31 9:30–11:30am 59258 Wed June 7–21 9:30–11:30am CMP $20R / $24NR Introduction to Computers II Move on from the basics of comput- ers in this course which is an extension of the Introduction to Computers. After a quick review you will be introduced to the various settings that are avail- able like automatic security updates, connecting to a printer, power settings, screen resolution, changing desk top background, changing your mouse set- tings, and the ease of access settings which lets you optimize the visual and audio. Prerequisites: Introduction to Computers or knowledge of basic com- puter skills. This is a three-week course. 59259 Tue May 9– 23 9:30–11:30am 59260 Mon June 12–26 12:30–2:30pm CMP $20R / $24NR Introduction to Excel With Excel you can keep track of all kinds of data. You can organize, sort, record data, enter in text, and mathematical equations. You can keep, track, chart, graph, and compare statistics, and main- tain records. You will learn about the dif ferent parts of Excel including the menu ribbon, what cell addresses are, and what columns and rows are. You will learn how to create a simple Excel docu- ment for keeping track of blood pressure and how to create a chart of the data. Prerequisite: basic computer skills. 59270 Thur April 27 12:30–2:30pm 59271 Mon June 5 12:30–2:30pm CMP $10R / $12NR Introduction to Facebook Facebook is a social networking site that makes it easy for you to connect and share with your family and friends online. What makes Facebook unique is the abil- ity to connect and share with the people you care about at the same time. You will learn how to create an account, create a page, add photos, create friends or family contacts, and manage your time- line and news feed. You will learn how to keep your Facebook secure, manag- ing your profile settings and posts on your Timeline. Prerequisite: Internet and computer basics. This is a two-week course. 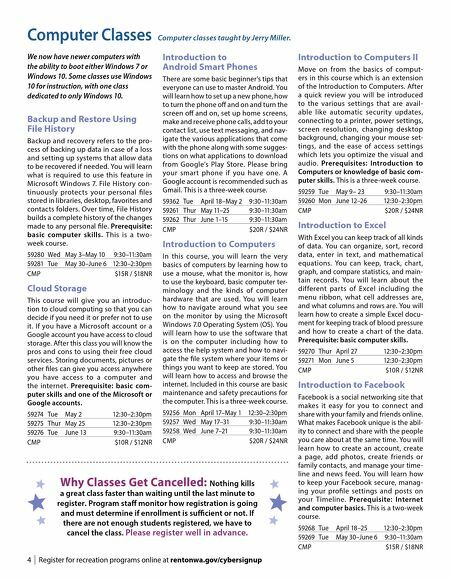 59268 Tue April 18–25 12:30–2:30pm 59269 Tue May 30–June 6 9:30–11:30am CMP $15R / $18NR Computer Classes Computer classes taught by Jerry Miller. Why Classes Get Cancelled: Nothing kills a great class faster than waiting until the last minute to register. Program staff monitor how registration is going and must determine if enrollment is sufficient or not. If there are not enough students registered, we have to cancel the class. Please register well in advance.